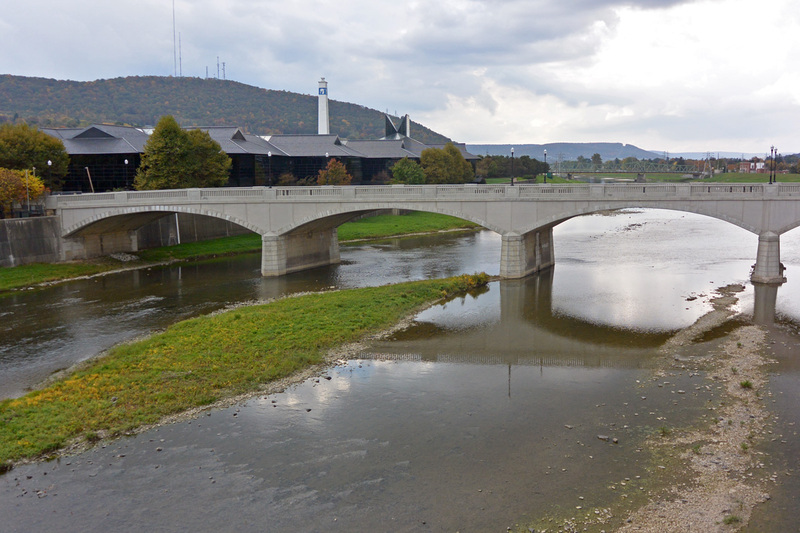 The frequently flooded Chemung River, a tributary of the Susquehanna, in Corning, N.Y. I didn’t expect western New York in October to be warm and humid, but then I didn’t know what to expect. When we train for a marathon, we start months in advance with a plan to build miles and endurance. This summer, we were slogging through many warm and humid days. I was hoping for cool and brisk, but that is not the way it turned out. Our trip up to the Wineglass Marathon, held October 6, 2013, started with a very nice cruise through Philadelphia and up the northeast extension of the Pennsylvania Turnpike. This in itself is a cause for celebration, knowing what this stretch of highway can be like. We stopped at Clark’s Summit, north of Scranton, for lunch with a good friend. On we went further north after lunch, around Binghamton, NY, then westward along the Southern Tier Expressway through Owego and Elmira. We passed the bridge with the village name of Horseheads chiseled in large letters. This village has the distinction of being dedicated to the pack horses of Major-General John Sullivan of the revolutionary army. The bleached skulls of the horses make for an interesting history. But never mind this distraction, we were on our way to Corning. 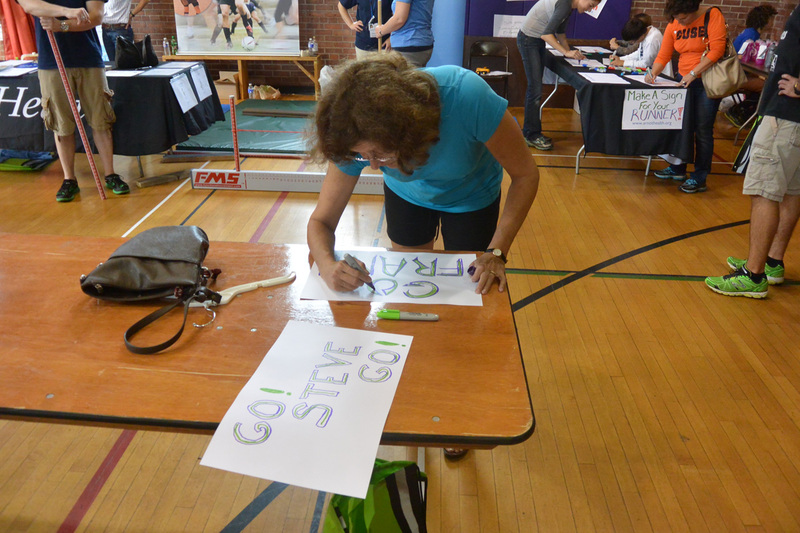 The expo for the marathon is held in the Corning YMCA, in a fortress of an old red brick building. It is not a big expo, in fact, rather small, but then this is not a huge marathon. The marathon and the half marathon are capped at 2500 runners each. 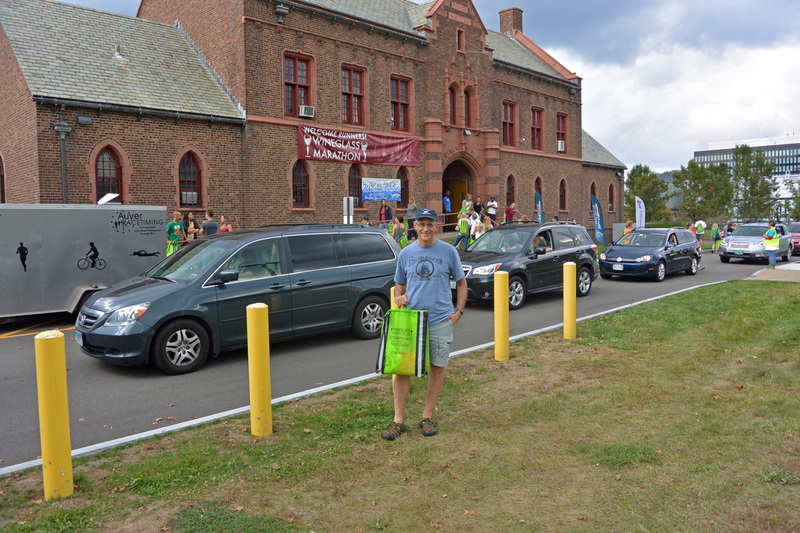 In front of the Corning YMCA, home of the expo. Encouraging signs from my wife for me and clubmate Steve. I picked up my number, and the number of my friend Steve, who was going to arrive a bit late. The friendly young lady behind the rail took Steve’s word by phone that she could trust me and allow me to pick up for him. Fortunately, I remembered to check for safety pins, too. After we picked up our numbers, we headed a little out of town to our motel, the Hampton Inn, of Corning. I am a fan of Hampton Inns. They always seem so comfortable and clean, and the complementary wi-fi and breakfast are nice benefits. We had a little trouble finding the Inn. We knew the address, but all we could find was a Denny’s and a gas station. Then, we spotted it. It was behind the Denny’s a little ways, with absolutely no sign directing one in to the parking area. No matter, we parked and went to check in. The pleasant woman behind the desk asked me my name, and then informed me that she did not see my reservation. Of course, I had made the reservation months ago, and even got an email from the hotel advising us that construction was going on, that there would be noise during the day, and that all of their facilities would remain open. Another front desk person came over, and they re-examined their records. As it turned out, the reservation I had made was for two nights starting the night before. I originally planned to come up Friday night. Since I didn’t show, they gave away my room and cancelled my reservation. They informed me they were completely booked, but that they would try to help find me a room in another hotel. Naturally, the marathoners had booked everything in several miles. Just as I was getting despondent, and here’s where they really shined, they suddenly realized that one room was not taken. This was a strange, very large, room on the first floor, close to the lobby, equipped with a board room-like table and chairs, a kitchenette, and a Murphy bed instead of a regular bed. While all the other rooms had been recently renovated, this room had not, and was in the process of a make-over. We, my wife and I, were more than happy to take it. The front desk person even assured me she would remove any charge for my missing the night before. After freshening up a bit, we joined with the other club members staying at the Hampton Inn and headed back to town for dinner. 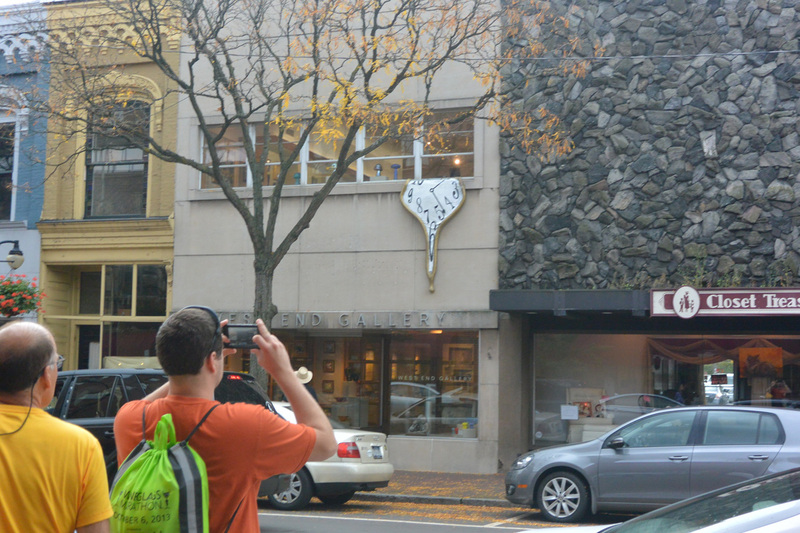 We found a place to park on Market Street, the main shopping and dining street in Corning. 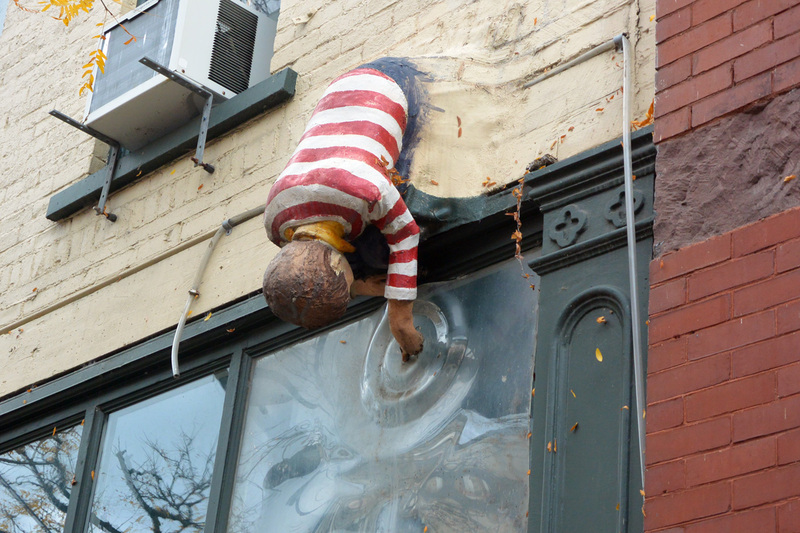 They have an unusual way of decorating shops on Market Street, with whimsical signage and artwork. A Dali-esque clock suspended from a second story window. It appears to be a boy dipping his finger in a pond. 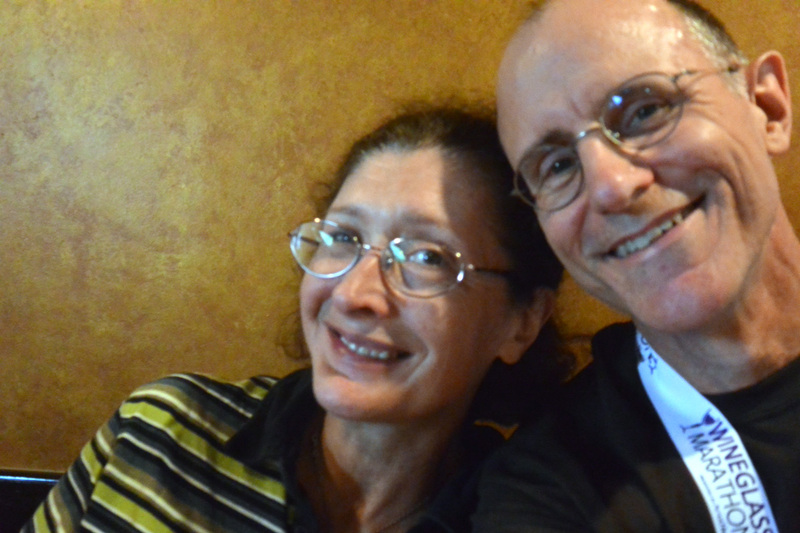 Steve called a few months ago to the restaurant, Sorge’s, an old, established Italian restaurant in Corning. He was assured that even though they don’t take reservations, they are a large restaurant which can accommodate a large crowd, and we would not have much of a wait. As you might expect, Sorge’s was packed, and we were told there would be about an hour or so wait. We were a hungry crew, and did not want to spend an hour thinking about food, and then another hour possibly waiting for it to arrive at the table. Right down the street there was a small establishment which appeared to have tables set up for an impromptu dinner. 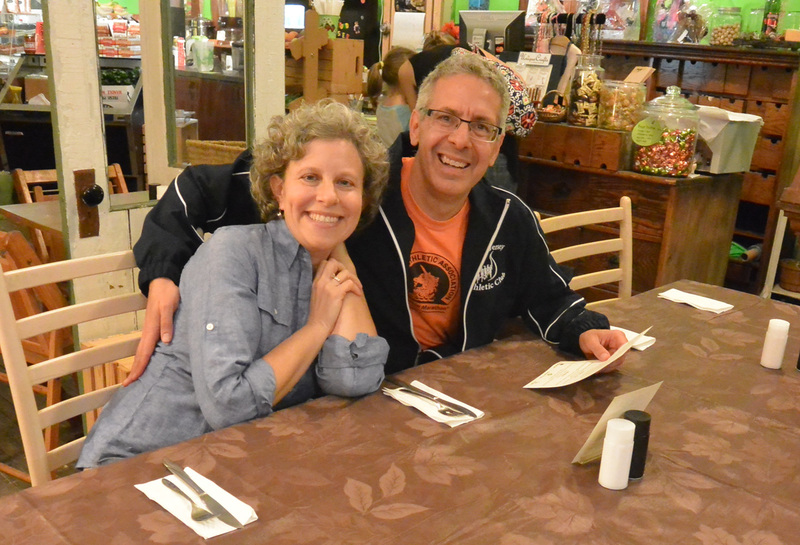 It was the Palate Cafe and Juice Bar, and they were serving a pasta dinner for the marathoners that night. We inquired, and it turned out a large party had skipped out on their reservation so they had room for us. 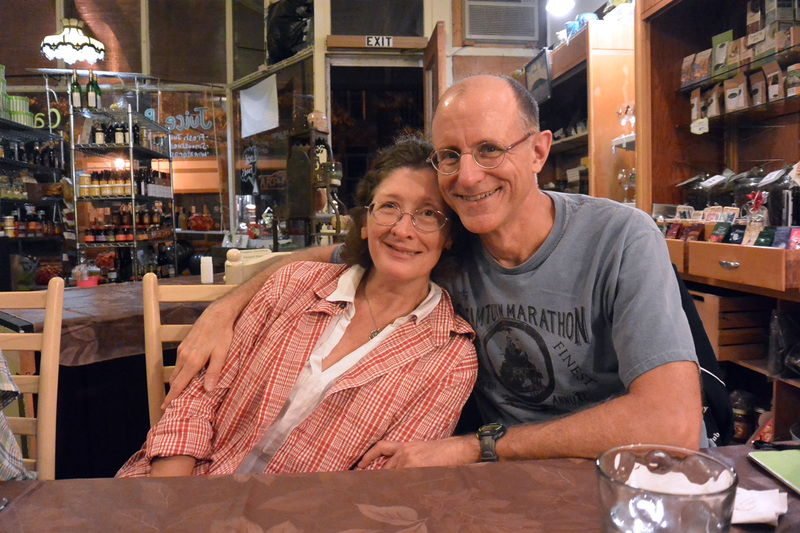 Two in our group, Sara and Brian, wanted a more normal restaurant experience, and chose to return to Sorge’s, but the rest of us settled on the home-cooked style of the dinner at Palate. It appears Palate specializes in wheat grass juice, and their website has a list of forty benefits and things to do with wheat grass juice, some of which I would never consider. Check for yourselves if you are curious. 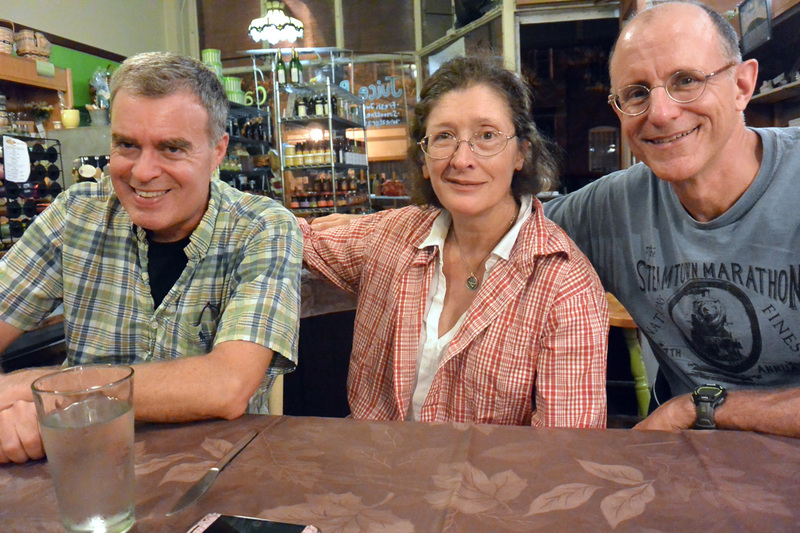 Tony, Kat and Frank getting ready to have a pasta feast. The dinner at the Palate Cafe and Juice Bar was acceptable, not spectacular, but it was pasta. We felt we had served our bodies well in the carbohydrate loading department. It was a family style affair, though, seeing the steaming pots and the rest of the preparation area assembled in a corner of the store usually used for other purposes. After dinner, we met up at a small bar down the street for a beer, the one beer I would have the night before the big event. We were definitely out-of-place at this locals hang-out. There were a few of the regulars standing outside smoking, and Tony seemed a bit intimidated by them, although he’s a lot bigger and stronger than they were. Inside, the choices for beer were limited, and they definitely focused on the usual, Bud, Miller and Coors. I asked for a Sam Adams, which was on tap, and without any evil look the bartender poured me one. I was grateful. Caren paid the tab for us and we sat at a small table near a group ranging from grandma to young adult-on-iPhone playing electronic darts. Now they did give us an evil eye or two, having crowded in on their territory. Our nervousness about the next day started to come out as we sat and drank, thinking about the weather, and the prediction for warm and humid conditions. After the beer, we drove back to our hotel in relative silence. Kat and I settled back in our room, the large space intended for meetings, and got into the Murphy bed. It was no regular bed, with awkward straps holding up a thin mattress. One had to adjust one’s body so that the hips and shoulders appropriately fit in the hollows created by the straps. I slowly drifted into dream world, thinking about what to wear the next day. The morning of the marathon I arose early, waking at my usual 5:00 AM. I checked the weather on my iPad. It didn’t look too daunting, with light rain and temperature in the mid 60’s at that moment. I could hear the rain outside, and it sounded a bit more than “light”. I decided to go with shorts and my club singlet, and my Saucony compression knee-high socks. Donning some light cover up pants and a jacket, I headed out to get breakfast, nicely set out for us runners by the hotel staff. They came in early to set up, since they usually don’t start serving until 6:00. 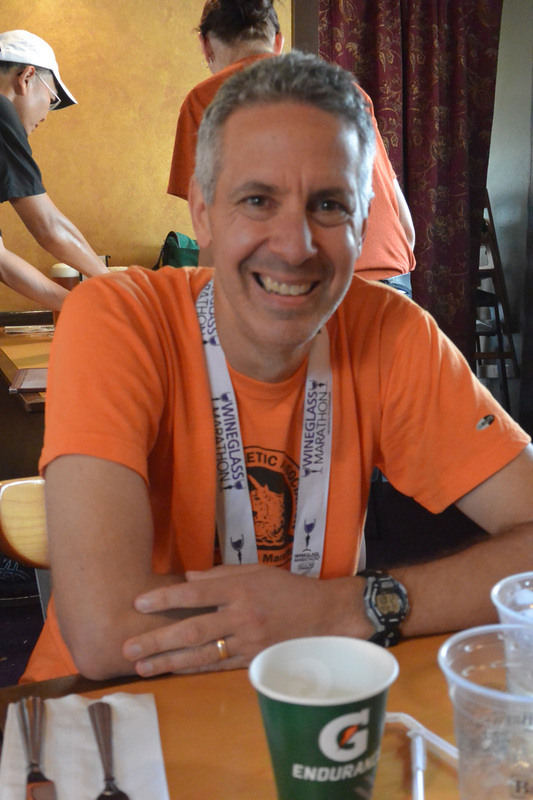 A number of other runners were there, having a coffee and some oatmeal. My club mates, Steve, Brian and Tony soon arrived, and we had breakfast. I went with the oatmeal, too, but Brian went for the pour-your-own waffle, freshly cooked in the waffle iron. After a bit more conversation and a second cup of coffee, we gathered our stuff and headed out. Caren was nice enough to drive Steve, Brian and me to the start, in Bath, N.Y., while Tony headed separately for the buses in Corning. Since he was doing the half marathon, his start was half way down the route from our start. We gathered up a hill in Bath at a Philips Lighting Company plant. 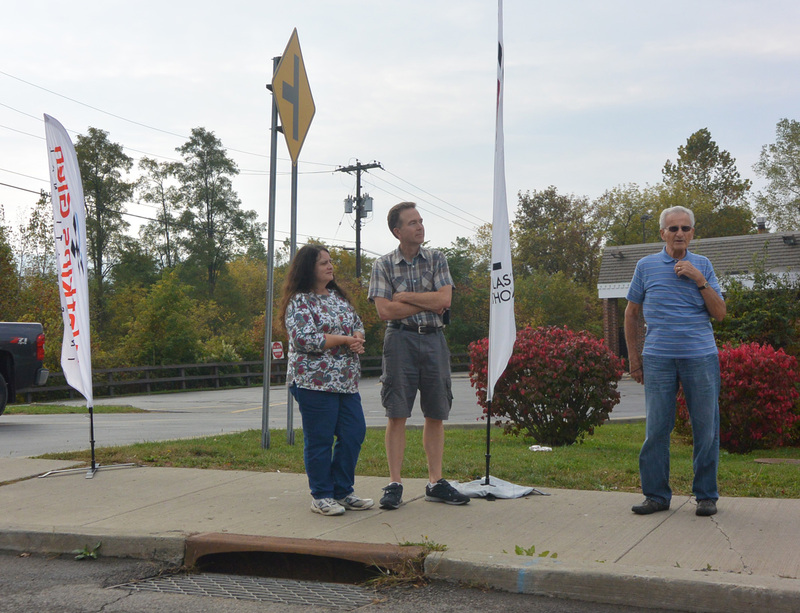 We were not aware at the time that the plant had closed, laying off 280 workers. It appears that due to changes in demands in the home lighting industry, this plant made the wrong type of bulbs, and so rather than change the technology in the plant, the company, based in the Netherlands, decided to close it. 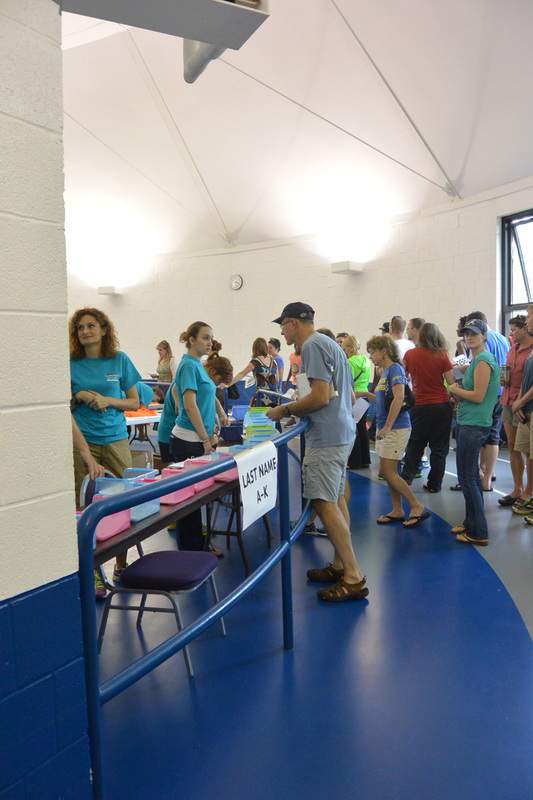 The start area was well equipped for the runners. There were plenty of portable toilets, and UPS trucks were waiting to take our bags to the finish line. Since the Boston bombing, all running events where bag check is allowed have gone to allowing only clear plastic bags provided by the race. It’s a bit like making every passenger remove his or her shoes to board a plane, since there was an attempt to set off an explosive in a shoe in the famous “shoe-bomber” incident. As we gathered for the start, it was misty and a bit warm. The runners lined up, there was a very nice rendition of the Star Spangled Banner by a local singer, and then we were off. I get an odd feeling starting a marathon. I don’t know whether I’ll cramp up or when, whether my training will prevail, or how long it will take me to get to the finish. One thing on my side, I’ve finished every one of the eight marathons I’ve run to date. 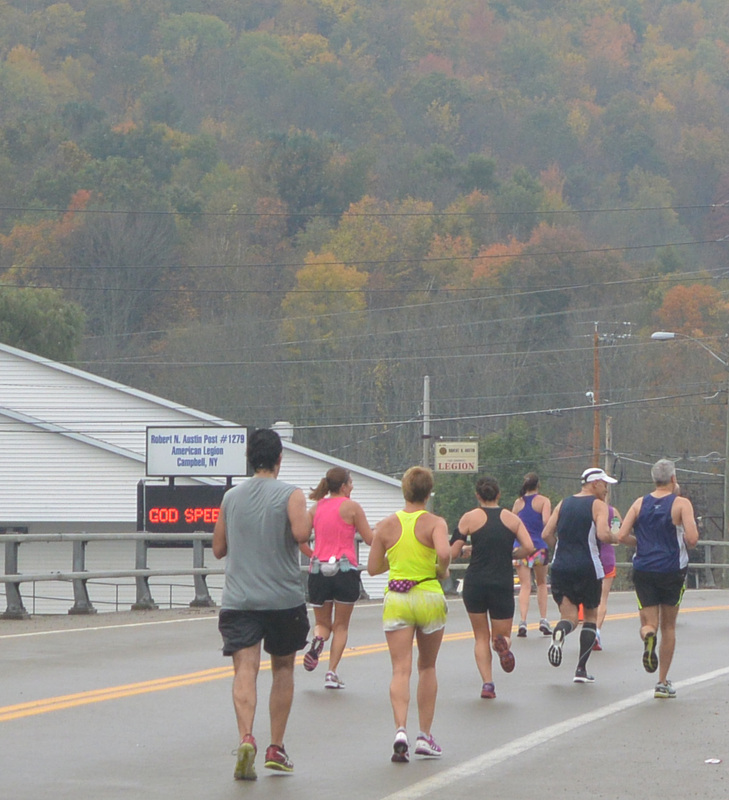 As we headed down the hill I was reminded of last year’s Steamtown Marathon. That start was a long down hill run, but this one was only about a half mile before the road flattened out. In spite of the warm, humid conditions, I was feeling alright. I kept reminding myself to keep my pace in check, and I kept it around an 8’35” pace, according to my trusty Garmin. I have the 305 model, with a large face which one of my friends referred to as a Dell laptop on my wrist. It is easy to read on the run, though! The early part of the race was very nice. My pace was good, the legs felt good, and the scenery was quite attractive. We could see the surrounding hills with trees turning colors, and there were ponds reflecting the colors. 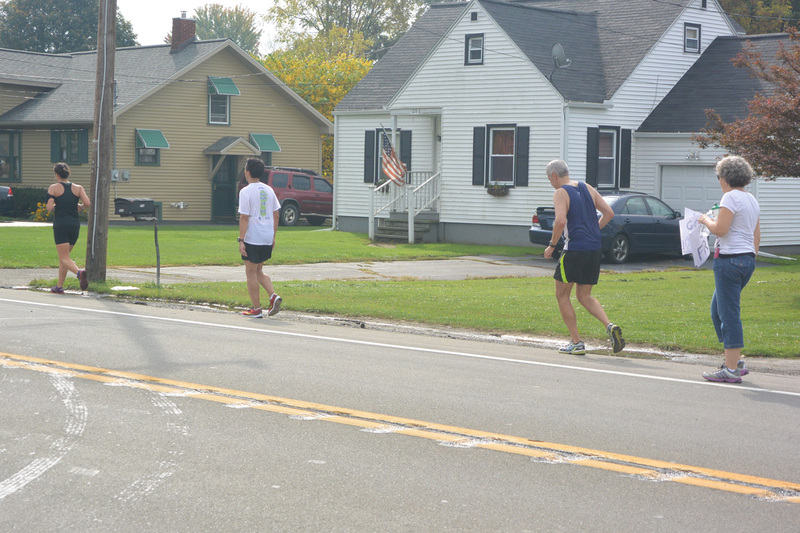 We passed through a few very small towns, and some of the locals came out to cheer us on, but they looked a bit sleepy, standing by the side of the road, coffee cup in hand, and not saying much. Moving on, Steve, running with me, and I were greeted enthusiastically by Caren and Kat, who were driving from cheering stop to cheering stop to give us support. I stopped for a moment to let Kat get a photo, but she yelled “keep going”, and I did. Frank (L) and Steve (R) moving on. Hey Steve, how much farther do we have to run? It did occur to me that I was losing a lot of fluid. My clothing was soaked and clinging to me, there was a constant flow of sweat from the brim of my hat, and it wasn’t raining, so the wetness was coming from me. I was stopping at every water stop, alternating Gatorade and water, and trying my best to keep well hydrated. The trick to drinking on the run is to crimp the cup. That way only a third of it sloshes out of the cup on me and my shoes, and two-thirds goes down the right way. We got to the half way point still feeling fairly good. By this time, the crowds had picked up and were very enthusiastic. After passing through the 13 mile mark, there is a significant hill, but it is the last of the real climbs. As we got into the second half, I started to feel the first signs of trouble from my legs. There were little twinges of muscle spasm coming from my calves, and I was getting concerned. 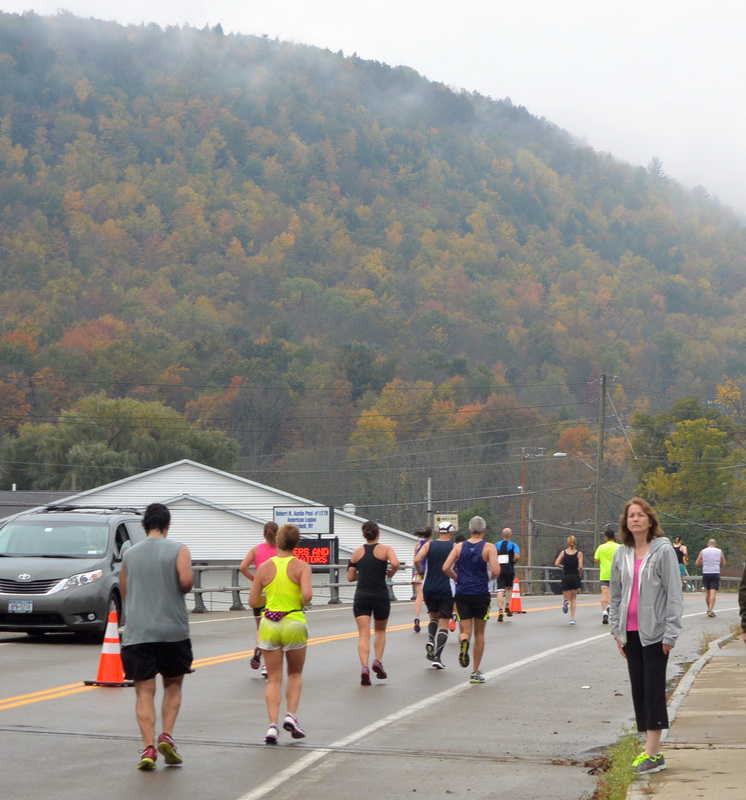 The last time I passed her, my wife held out a water bottle filled with sports drink, which I grabbed and downed along the route. I also was taking gels, about one every six miles. Caren, heading out to give Steve some encouragement. She may have told him to “be careful, we need you at home”. He was looking better just a moment ago. Perhaps the photos project the warm and steamy conditions we were facing. The rubber bands had snapped, the legs had turned to pudding. By around mile 18, both Steve and I were shot. In spite of working hard to stay well hydrated, it seemed the loss of sweat, and the inability to get rid of body heat had taken a toll on us, and we both wound up walking a ways. It really is amazing how much time one loses off one’s goal when the walking starts. At this point I recognized that my hopes for a Boston qualifier were not going to become reality, so I did what I could to make it to the finish without hurting myself too badly. Even the supporters along the route were a bit subdued. My legs were toying with me. One moment I was able to run, the next they were cramping up and sticking out to the point I could hardly stand. I was reminded of Peter Sellers’ arm in his role as Dr. Strangelove, and his “alien hand syndrome”. Walking was the best I could muster around miles 18-22. After some walking, some more Gatorade, and another gel, I felt revived enough to run again, although I had completely lost my stride. I was able to manage around a ten minute mile, and I kept trudging along. 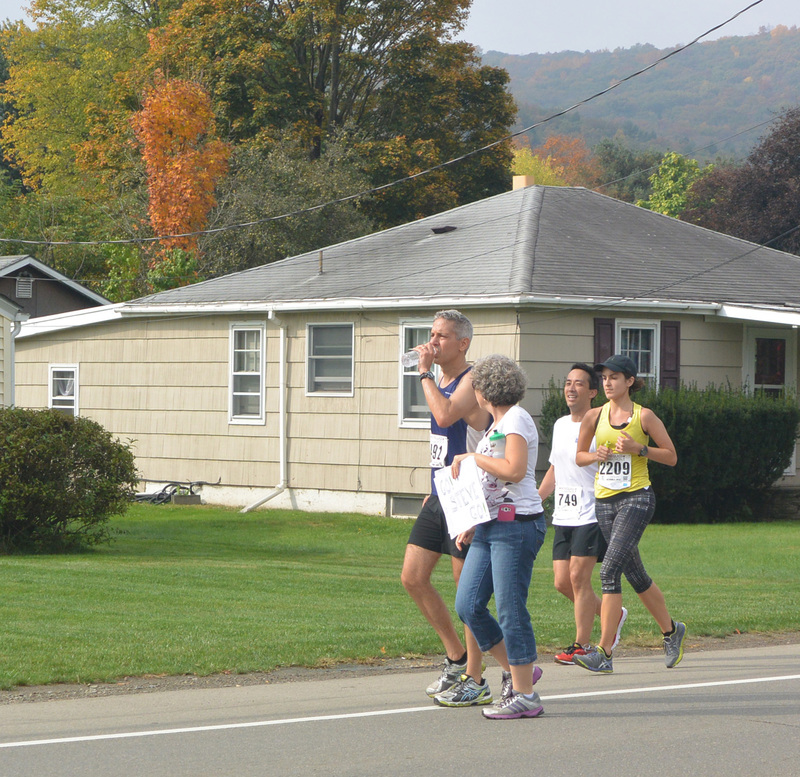 I noticed an awful lot of other runners doing the same at this point. My plan, what I had practiced for, was to pick up my pace at this point to go for a good finish. That plan will have to wait for another day. Back to a running stride, and trying to keep smiling. About the last four miles we headed through a park along a bike path, and I could see we were starting to get close to finishing. The legs, while not working well, were at least working, and I managed to carry through to the finish line. The last stretch before reaching Market street is over a bridge, with a slight rise. This gave me cause for concern, but my fears were unnecessary, as I crested the relatively minor hump without incident. 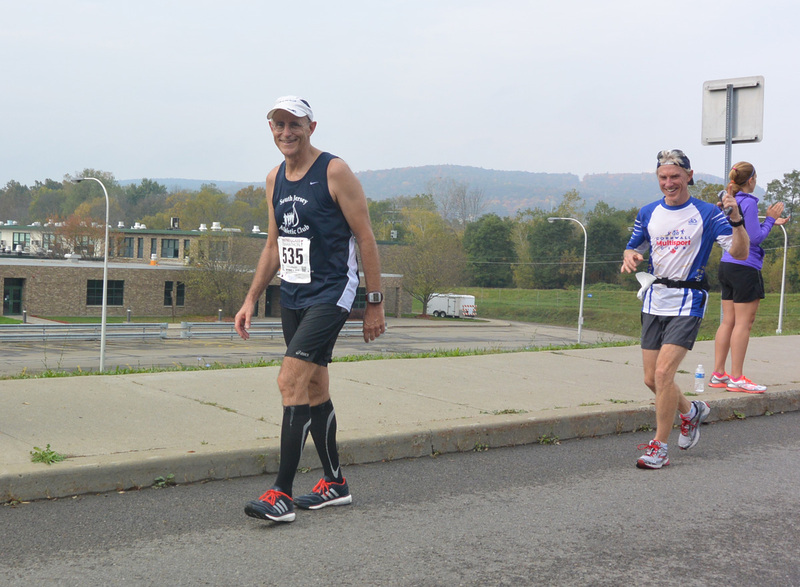 On the other side of the bridge, Tony, having finished his half marathon, was cheering on runners and spotted me. He yelled “go Frank, you’re looking good”, and it definitely helped. The finish down Market Street is a very nice finish. The crowds were out and yelling for us, and I could see the finish line in the distance. I saw a bank sign with the temperature showing 80 degrees on that last stretch. As I crossed, it was a great relief to stop. I needed fluids, and I quickly downed two bottles of water and grabbed a third. I received my medal, a large glass medallion in purple, hanging from a broad white ribbon. I walked through the food line, took some broth and a few other items, and met up with Kat, who had spied me on the final stretch. It was great to see her smiling face at the end of the race, and have her support all along the way. 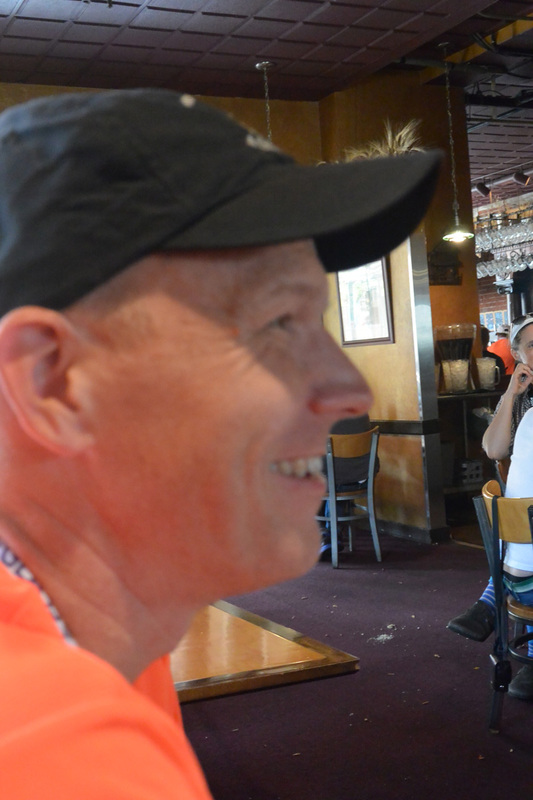 After the race, we headed down towards the Market Street Brewing Company, where we all met up for lunch. 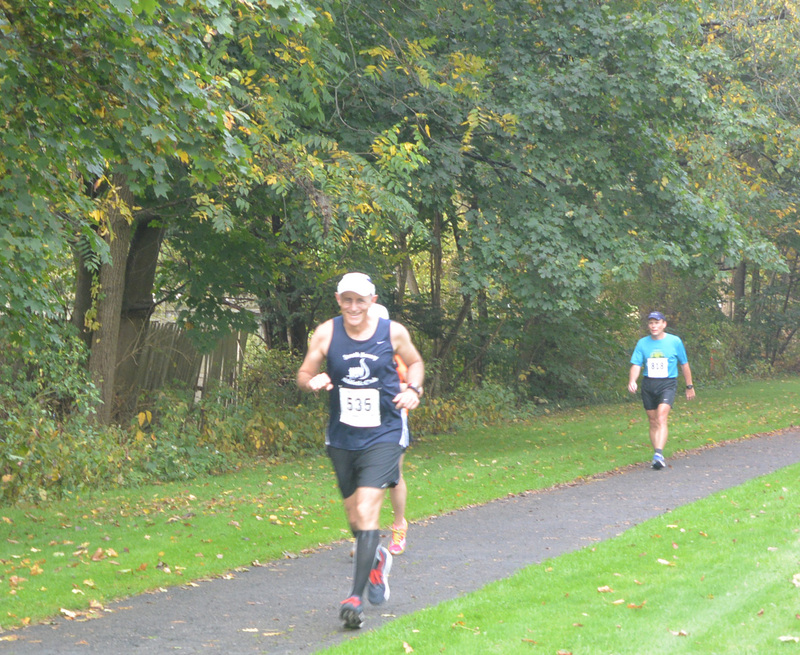 Brian had turned in a terrific performance, given the conditions, finishing in the 3:34 range. I had come in at 4:21, and Steve a bit behind that. We all agreed that the race organization and course were very good. I would certainly like to do this marathon again. I just would rather do it when it is in the 40-60 degree range and dry, not 70-80 degrees and humid. But, one can’t plan that part of the marathon, and you take the conditions as they are. Brian, who turned in a great time. 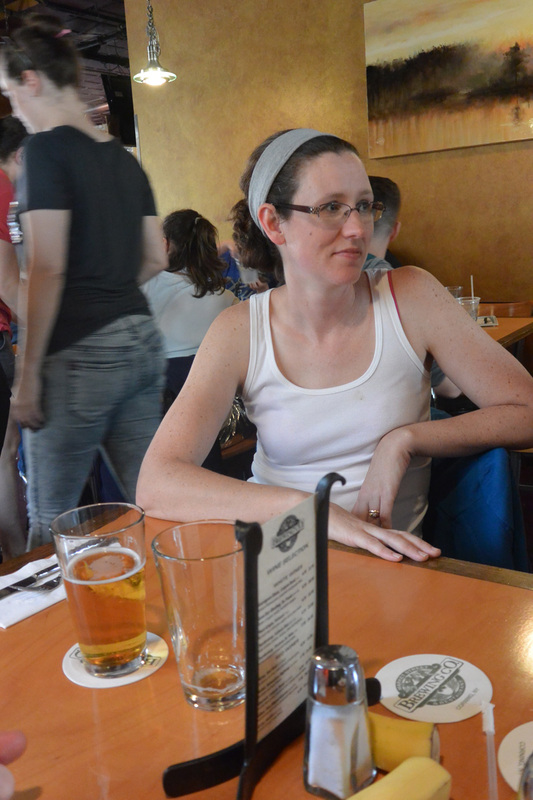 Brian’s wife Sara, displaying the sleeveless “T” look for a hot day in October. 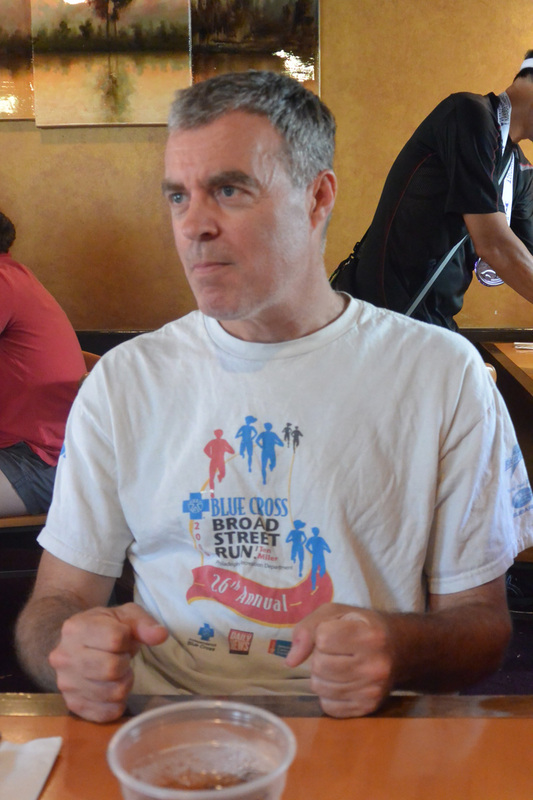 Half marathon man Tony, who will be running Boston this spring. Steve, who suffered the most this marathon. Kat and humble author Frank, two beers down. Yesterday, the temperature shot up to close to 100, which, according to Walter, our in-house meteorologist, was due to the fact that it is summer. I re-asked the question: why had it been so nice the last couple of weeks then? This was apparently due to a low pressure zone in North Carolina sucking cooler air down from the north. Anyway, yesterday was my first 10 mile Wednesday run, the first of many, and it was brutally warm. I still found, though, that the legs performed admirably in spite of the heat, and I got in the ten, perhaps a bit slower than if it had been twenty degrees cooler. The usual Wednesday evening crowd for this group run was thinned considerably, I guess because it was so hot. After finishing the run, and taking on considerable amounts of water, standing outside in the slight breeze felt nice and cool as the sweat evaporated. I walked home feeling good that I didn’t skip the run because of the heat. On a beer note, I treated myself to a Long Trail Unfiltered Belgian White, which is very refreshing and has a bit of a sour bite and looks cloudy in the glass because it is unfiltered. Yeast is good for you.